1) February 11 2005 from Gig Harbor till arrival Portsmouth, Va. on June 18, 2007. First stop after Santa Barbara at Hiva Oa in the Marquesas, the longest non-stop leg of 3000 miles. Some of the other stops: Tahiti, Samoa(s), Wallis, Fiji, Vanuatu, Solomon Islands, Papua New Guinea, Palau, Philippines, Vietnam, Malaysia, Bali, Christmas Island, Seychelles, Madagascar, Mozambique, South Africa, St. Helena, Brazil, French Guyana, Surinam and Trinidad. 2) January 14, 2008 until June 2009: Round-trip from Virginia to North Florida for boat maintenance on the I.C.W. and Atlantic, a summer cruise on the Chesapeake Bay. And a round trip to the Caribbean from November 2008 till June 2009. 3) June 2009 departure Beaufort, N.C. North Atlantic Crossing, via Bermuda, Azores, France arriving Amsterdam August ’09. 5) From Amsterdam to Tagomago Fall 2013. This distance converts to 88.605 KM and 55,056 Statute Miles. The circumference of the earth at the Equator is 21,600 Naut. Miles which means that “Fleetwood” covered a distance of nearly 2 ¼ times the earth’s circumference, or ¼ of the distance to the Moon. All was done single handed with the exception of the 1,750 miles between the Azores and Amsterdam, 120 miles on the I.C.W. in 2008 and 250 miles on the Meuse and IJssel in 2012. When the time came for my boyhood dream to come true at age 65, in 2002, I was broke. There were months that my landlady had to wait a couple weeks for my rent to be scraped up. “Fleetwood” escaped the 2000 business and personal bankruptcy. In 1994 I was still worth over a million. A new life started with my first social security check. I started with getting “Fleetwood” ready. She had sat on her trailer for 10 years while I worked hard to try and turn my business around from a hard knock. I am writing this for the benefit of you who think that it needs a lot of savings to go to sea. Keep the boat small and the equipment simple. Choose your seasons and sailing routes carefully. You can follow the voyage with detailed “Logs” and slide shows of the many places visited. You can find them on the Index of the home page. The visit to Vietnam in 2006 where I had spent 1 ½ years in the U.S. military in the early sixties. Next the four years in Europe, visiting my Dutch roots. The Danube trip was another long held dream come true. Passing through and skirting 10 countries in the cradle of Europe; continued in the Black Sea along the beautiful Bulgarian coast through the Bosporus, into the Mediterranean Sea. 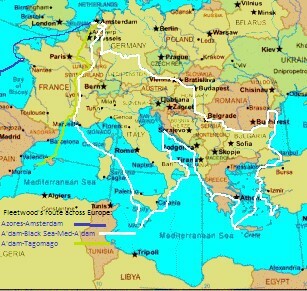 Instead of the original plan to sail out of the Strait of Gibraltar in 2012 and back to South America, I decided to go back up to Holland for my last Tango. My granddaughter, Corrine finished her last year of her American university classes at the University of Amsterdam in December 2012. I published the original Dutch version of “The Mastmakers’ Daughters” January 2013. The replacement of my teak deck that summer, in Amsterdam, took me beyond the safe sailing season in the North Atlantic and I chose the inland route through France to the Mediterranean in late September. I had intended to return to South America via the Canary Islands in the winter of 2013/2014. The shipwreck in the Balearic Islands on November 16, 2013 put an unexpected end to that plan. I arrived back in the Pacific Northwest in early April 2014. Through another stroke of luck I managed to purchase an identical NAJA replacement of “Fleetwood” at an affordable price. 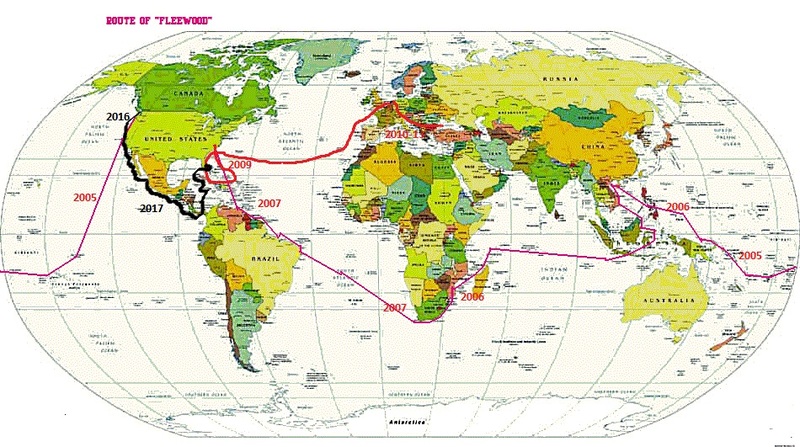 I completed the circumnavigation 31 days after my 80th birthday, on March 31st 2017, by connecting with my 2007 inbound track from Cape of Good Hope, at Fort Lauderdale, Florida. The adventure continues. Stay tuned…. My friend, Fred Richards, whom you knew at Green Coves Springs, Florida, said that I should get in touch with you. With much guidance from Fred and others, I will soon start cruising offshore at age 65, like you did. A native of Eastern Washington State I have a Downeaster 38 near New Orleans that I am fitting out — on a low budget, like you did. We have similar past stories. Would you please contact me to share ideas and information? Hello Jack, it’s quite som time since we met in Milna in June 12, a party of norwegians aboard a 37 Bavaria we rented. It’s been so great to follow your page and see all your exciting trips an visists. I was qiute chocked when I learned of Fleetowoods demise last november, and I am so happy to hear that you have founf a new Fleetwood. Sounds just great. Really hope you get to “finsih” your surcumnavigation in her. Good Look to you! I am retireing in som 60 days and will have lots of time for sailing so if you need another crewmember just till me! Wish you yearsw of happy sailing still! Per from Norway! Tusen Takk, Per. Yes. I remember you Vikings. Keep an eye on my future destinations and you are “Wilkommen” any time.